Vienna is the setting to decide the first matches for EHF EURO 2014. 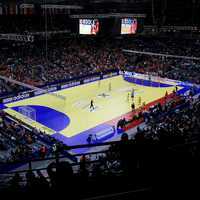 Thirty nine nations, including the event organisers Denmark, have registered to take part in the Men’s EHF European Championship. Phase 2 will be played in a home and away format, seven groups of four teams in six qualification rounds. Teams are playing for fifteen places, Denmark qualifying by right as organiser. The defending champions, in this case also Denmark, no longer receive a place from 2014. The ‘fifteenth team’ will be decided from the third best ranked team in the qualifications groups. Only the matches against the first and second placed teams in each group taken into consideration. A total of 22 teams directly qualified for the Qualification Phase 2, the four teams having qualified directly for the 2013 World Championship final tournament (Serbia, Croatia, Spain and France) and all those teams already qualified for the 2013 World Championship Qualification Europe Play-offs. These are (in alphabetical order): AUT, BIH, BLR, CRO, CZE, ESP, FRA, GER, HUN, ISL, LTU, MKD, MNE, NED, NOR, POL, POR, RUS, SLO, SRB, SVK, SWE. The draw for Phase 1 is scheduled for 27 March 2012 in Vienna, Austria and for Phase 2 on 20 April 2012 in Copenhagen, Denmark. BEL, CYP, EST, FIN, GBR, GRE, ISR, IRL, ITA, LAT, LUX, MLT, ROU, SUI, UKR, TUR. Phase 1 will be played in 4 groups of 4 teams. The winners of each group and the two best ranked second teams of all four groups will qualify for Phase 2 of the EHF EURO 2014 Qualification (in total 6 teams). Step 5: The draw of the teams having the right to organise the qualification tournament. The matches will be played in form of tournaments at one weekend at one venue each (Friday 8 June to Sunday 10 June 2012). Download an overview of the EHF EURO 2014 Phase 1 Qualification Draw procedure can be downloaded here.